Clockwise: Proceeds from the Lego Polybags will go to UNICEF’s effort to help build a center for disabled children. | The remnants of my brand new Belkin iPhone 6 Plus Lego Builder Case. | Today’s Lego haul: A 583-piece Lego Classic Creative box (10702) [The last unit they had on the table], Lego Painting Easter Eggs (40121), Lego Trick or Treat (40122), and The Lego Movie Polybags: The Piece of Resistance (30280-1) and the Super Secret Police Enforcer (30282-1). 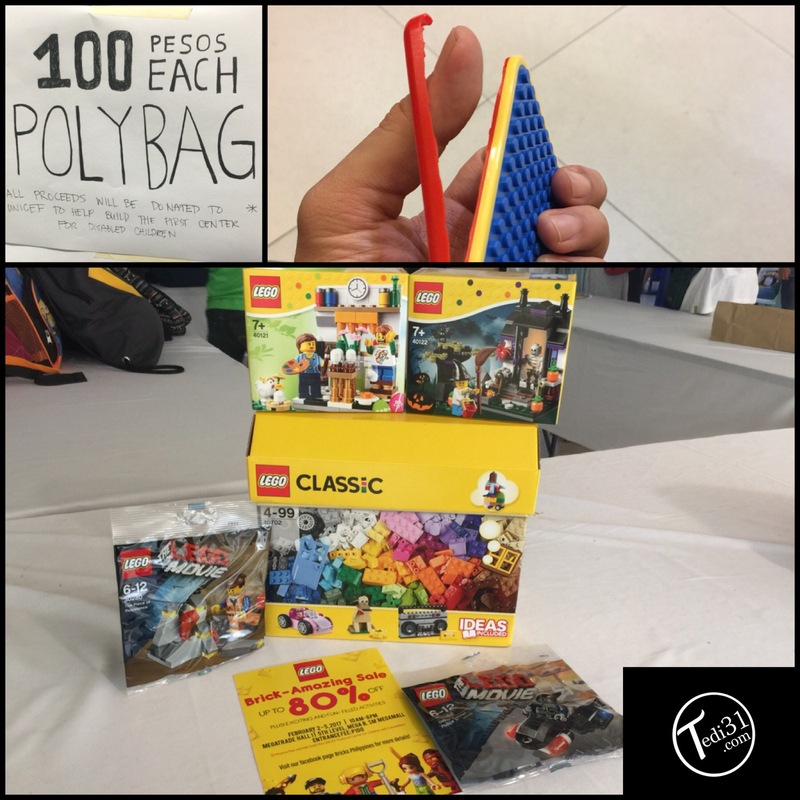 Today was the last day of the 4-day Lego Brick-Amazing Sale over at the Megatrade Hall 1 in SM Megamall and if you had a chance to drop on any of the days–you would have surely come away with something. I had seen first-day posts online and was hopefully that the set I had wanted (the Lego Super Hero Airport Battle ) would still be available. Sadly, that particular Captain America: Civil War set flew off the cloth draped foldable tables by the time I got there last Friday afternoon. It wasn’t a total loss though as I was able to score a Belkin iPhone 6 Plus Lego Builder Case, Lego Valentine’s Day Dinner (40120-1), and a couple of The Lego Movie Polybags for a fraction of their local retail value. Fast forward to yesterday afternoon at the Mall of Asia Arena (MOA Arena) where I decided to take the Lego Builder case for a test run. It seemed fine at first–then I started to notice some peeling from the Belkin case’s base. I likened the situation to pulling a sheet of paper from a notepad. By halftime of the Phoenix Fuel Masters and Star Hotshots game, I had to retire the case for good. It was so brittle that the entire left side (pictured above) was completely detached by the time I reached home. I attributed the defect to a possible storage issue or even the age of the item. Needing a replacement, I went back to Megamall today and the person assigned to me gave me credit for the Belkin case. It turns out that they were no longer selling the item as other units were tucked away in the back of the counter. I can only surmise that I wasn’t the only one who was unhappy with the product. That said, I came away with the last Lego Classic Creative box (10702) that they had, Lego Painting Easter Eggs (40121) and Trick or Treat (40122) sets, and a couple of more The Lego Movie Polybags to help the organizer’s UNICEF donations towards building a center for disabled children.